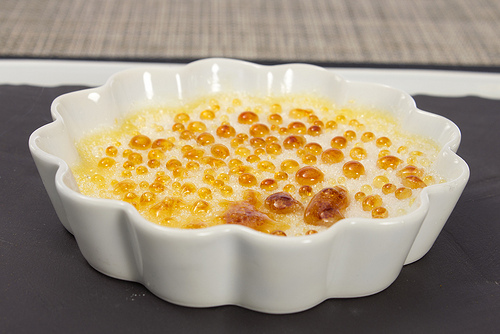 Creme Brulee is one of those desserts people tend to stay away from, however this simple recipe may change their fears. It is an amazing go to dessert that can be paired with almost anything and is great year round. 1. Whisk the cream, egg yolks, sugar, and vanilla extract together in a bowl. Mix it all up until it gets nice and creamy. Pour this mixture into 7 ounce sized ramekins/oven proof dish. Place the ramekins in a baking pan. Fill the baking pan with hot water, about halfway up the sides of the ramekins. Place the pan with the ramekins in the oven for approx. 45 minutes. After 45 minutes, check them every ten minutes. They are done when you can stick a knife in one and it comes out clean. Remove the ramekins from the baking pan, set them on the counter, and let them cool for 15 minutes or so. 3. Sprinkle a thin layer of the light brown sugar on the top of each. Make sure it's a THIN layer, but also make sure it completely covers the custard. Now torch the tops till golden brown with a hand held kitchen torch. Or, if you don't have a torch, you can put them under the broiler for a minute or so.